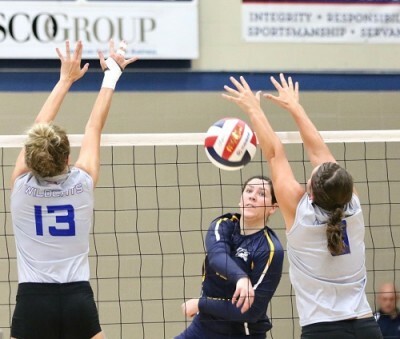 The Mount Mercy women's volleyball team has gotten off to a nice start this season with an 11-and-2 record, but Coach Deb Marlin knows there's a long way to go for the Mustangs. 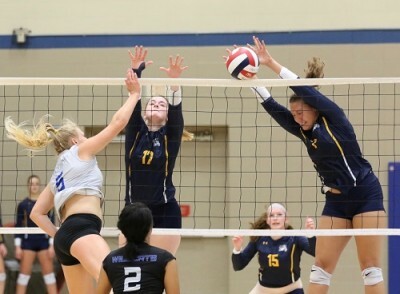 Mount Mercy swept Culver-Stockton, 25-15, 25-20, 25-22, in the Heart of America Conference opener at the steamy Hennessey Recreation Center Tuesday night. "It's a great start," Marlin said. "We've done what we needed to do. There's one match that we would like back. Our other loss was against a really good team, and I thought we played well in that match. "But at the end of the day, the toughest part of our schedule is yet to come. If we can keep everyone healthy and keep fine-tuning our game, we've looked really good at times. We can play with anybody, I believe, in this conference." Lauren Stopko, who became the career digs leader at Mount Mercy this past weekend, collected 23 more Tuesday to help pave the victory. The 5-foot-5 libero from Tiffin now has a whopping 2,028 digs in her four-year career with the Mustangs. "That kid does not get out-worked," said Marlin. "And if she feels like she has been out-worked, she takes it personally and gets upset." Becca Thomson led a balanced attack at the net with 12 kills. Alyssa Weldon had 11 kills, with Maddie Bell and Olivia Coe finishing with nine apiece. Kayla Daggett rolled up 38 assists in three games. Weldon had 13 digs. Bell and Daggett each had two blocks. Marlin liked the way her club played for the most part, but said the Mustangs need to eliminate the "afraid to make mistakes" part of their game. "I'm all for aggressive errors," she said. "I tell the girls all the time, if it's an aggressive mistake we're good with it. It's a game of errors and you have to be OK with it. "But we have to go out and stay aggressive in everything we do, with our passing, our defense and our offense."